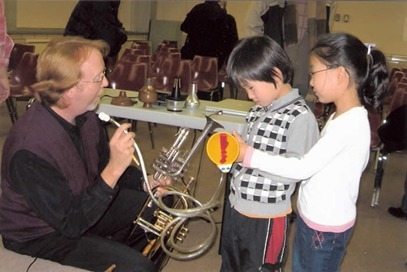 Symphony 101 is a free educational, family-friendly lecture/demonstration series launched in 2009 in partnership with Queens Library, as well as an extension of the QSO’s mission to educate the general public concerning the artistic and professional possibilities in the musical and performing arts industries. This series provides a historical and intellectual context for many of our most timeless compositions. Key members of the QSO will present certain subjects before opening up the conversation, allowing our audience a personal, interactive experience of these pieces, removing orchestral classics from the page and placing them firmly in the hands of the community. The orchestra concert experience is enhanced as the listener gains an intimate knowledge of the composer’s writing style and interpretation, the distinct sounds and history of the orchestral instruments, and the role of the conductor in leading the orchestra. With the assistance of one of QSO’s professional musicians, the QSO Music Director discusses pertinent and unique information about each instrument family, including a slideshow presentation with musical samples showing a variety of instruments; also included are performance demonstrations by our musicians. In the past year, this program has been further expanded to include five instrument-making workshops with audience members. Each of the instruments is made in one of four sessions, and then all instruments are combined in the fifth and final session, which includes a special instrumental improvisation workshop led by the Music Director with all participants. The QSO is committed to bettering the lives of students in Queens public schools. By revealing the inner-workings of the life of a musician, conductor, or general manager, the QSO intends to make real a life in the performing and musical arts for those to whom it may seem unrealistic. Symphony 101 is sustained by allocations from city council members as well as a grant from the New York City Department of Cultural Affairs.